The E-117 Tri is a fast and comfortable triathlon bike designed to meet the needs of all triathletes—young or old, experienced or novice. Moreover, thanks to its proven aerodynamics and triathlon-specific geometry, the E-117 Tri will help you rise to your every challenge and overcome any and every obstacle in your path. 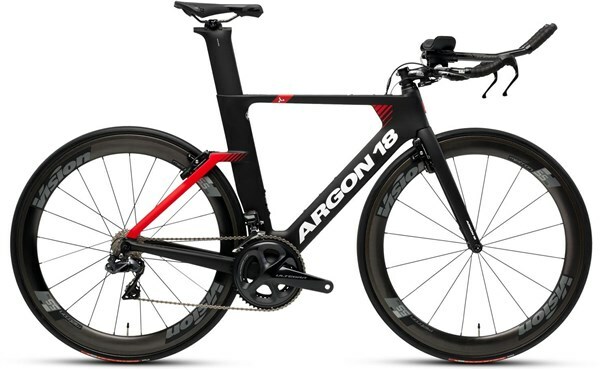 Triathlon-Specific Geometry Aerodynamic Frame, Fork and Seat Post - As aero as the E-118 Next in true wind conditions (5° to 20° yaw angles). UCI Approved - Approved model for all Union Cycliste Internationale races. Optimal Carbon Fiber - Designed to be high performance and even lighter. Proven Front and Rear Braking System - Minimizes the frontal air impact zone and reduces drag at the back. Concealed Front Brake - Ultralight and easy to adjust. Press-Fit 3D System - Extends positioning flexibility by offering 3 head tube heights for every frame size without sacrificing any rigidity; system preserves 5% and 11% more incremental frontal rigidity vs. standard spacers when the handlebar is set at 15mm and 25mm respectively. Travel Friendly - No complicated hardware, easily removable cockpit and wheels. Classic Derailleur Hangers - Make for easy wheel changes. Size-Specific Geometry - Well balanced ergonomic fit for every frame in every size. Optimal Balance - Outstanding aerodynamics, added comfort, lightness and rigidity, all rolled into one totally integrated package.